Joe readies the magnetometer for a magnetic survey. Geolex owner, Joe Michaletz, is a licensed Professional Geologist (Wisconsin #1169) with an educational background in geology, geophysics, sedimentology, and hydrology from the University of Wisconsin - Madison and the University of Adelaide, South Australia. His experience includes 25 years of geologic and hydrologic work throughout Montana and the Midwest. He has performed various proprietary investigations including structural and stratigraphic mapping for oil/gas interests, coal definition, mineral evaluations in complex igneous and metamorphic regions, hydro-geologic analyses in bedrock and alluvial aquifers, water development, and aerial photography interpretation and photogrammetry. Major clients include law firms, real estate conservation organizations, ranch/land managers, environmental engineering firms, and private individuals. Aaron is a Geophysical Engineer from Seattle, Washington and graduated from Montana Tech with a B.S. in applied Geophysical Engineering with minor options in Statistics and Mathematics. He has experience with shallow geophysical investigations including: ground penetrating radar(GPR), total field magnetics, electrical methods, and seismic surveys. As a member of the Geolex team since 2014, he has been involved in field operations gathering and also processing magnetic and GPR data. Scott is from Salt Lake City and has degrees in Physics (B.S., Beloit College, 2008) and Geophysical Engineering (M.S., Montana Tech, 2013). He has worked in environmental consulting (including the Key Bank Tower implosion in Salt Lake City) and mineral exploration. 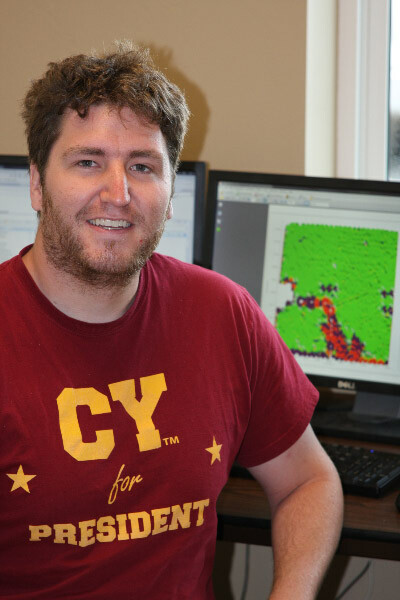 Since joining Geolex in 2013 he has worked collecting, processing and interpreting seismic and magnetic data. He is currently pursuing a PhD in Electrical Engineering at Portland State University. Cy Webster is a Geophysical Engineer with a B.S. from Montana Tech of The University of Montana. He has experience with almost all shallow and down hole geophysical methods. His major contributions besides field work are software development, software maintenance, new filtering techniques for all applicable geophysics, and website management. Cy has been with Geolex Inc. for over 7 years, but is currently on sabbatical while plotting to overthrow a small Central American nation. The Geolex Crew enjoying a beautiful, unintentionally color-coordinated day in the field.